At this point, the only standard gauge (HO) engines that I could see myself wanting (and at all likely from having appeared in the show) are Daisy, BoCo, and Stepney. I don't see BoCo or Stepney happening at this point, but I really thought that Daisy would be announced this year because she was coming back to the show and because Bachmann has tended to stick to characters from the early seasons with Emily, Spenser, and Salty being the closest to "modern" characters that they have made new toolings for (and Winston if large scale is counted). I also see Daisy as potentially being easier than some other candidates to produce. I would imagine that Bachmann already has a Bo-Bo diesel chassis from other models that could be used as a starting point, and her overall shape is essentially a box. I would expect that a Bachmann Daisy would have all of her windows blacked out in order to hide her motor and eye mechanism, which is a shame, but I could of course live with it. Rolling stock wise, I would love to see at least Isabel (all four autocoaches would be great, but I won't go there), though I don't see her ever happening. Bachmann Branchline actually does make a maroon autocoach, so in theory, they would just need to Thomas-ize it. Other than Isabel, I don't really think much is necessary except perhaps some varied brakevan designs and the occasional new troublesome truck. Something like a log car would be good, but there really isn't a need for a specifically Thomas branded version of an item like that. If they did do Daisy and wanted to hide the internal compartments like they do with the tank engines, it might be easier and more visually pleasing to use frosted window glass. It would definitely look better than big wide blackened windows. If they did do Daisy (and I really hope so), they most likely would give her gray windows like all the other diesel engines. I really like the idea of frosted glass windows. I hadn't thought of that. Though I can't help but agree with Duke that gray windows like the Mavis and Diesel models are more likely. Another potential issue with Daisy is mounting a front coupling because of how far down her body and face go over her wheel base. I believe her ERTL model from back in the day didn't bother to give her a front coupling, possibly because of this. It's not terribly important that she have one because she's not meant to be hauling anything, but I could see it turning people off if the model lacked one as well. true, unless bachmann will model her in her CGI form. Daisy has been appearing more than she's ever had in the model series. Now, I really want a Bachmann model of her. It's really possible now. I think I want her more than Paxton or Sidney. In Sodor's Legend of the Lost Treasure, and The Great Race, she was there for fanservice. Now, in Season 20, she's feeling like an ACTUAL CHARACTER, and that's better. Daisy, along with Donald and Douglas, have definitely not had missed opportunity in their reintroductions this year. Since the former was pretty much ignored in the Allcroft era, the new writers are clearly not hesitating to exploit her for episode ideas, and I'm very satisfied with their efforts. If Daisy does get made by Bachmann, I'd actually prefer her CGI render. Her face looks much better now in all honesty, and her front buffer beam doesn't look like it's low riding. At this point, if Daisy does get made, I would love if they made Ryan to go with her. He's not the most likely choice, no doubt, but with Rosie being made, Ryan doesn't seem too much of a far fetched idea now. Ryan has proven to be quite popular already, and I can see him getting made rather than Marion, Diesel 10, or even Hiro. With the recent news of the slate wagons having pictures up, I recently found out that the two numbered slate wagons (101 and 164) are the exact same numbers that are printed on two of the real Talyllyn slate wagons. With that in mind, I wanted to talk about the next logical choice, for narrow gauge rolling stock which would be coaches. Seeing as how the coaches in the show are based off Talyllyn coaches it makes me wonder if Bachmann will make coaches in a similar fashion to how they did the slate wagons. The only differences between them would be the numbers or possibly being labeled as 1st, 2nd, and 3rd class coaches as well as having a closer resemblance to the real basis of the coaches. 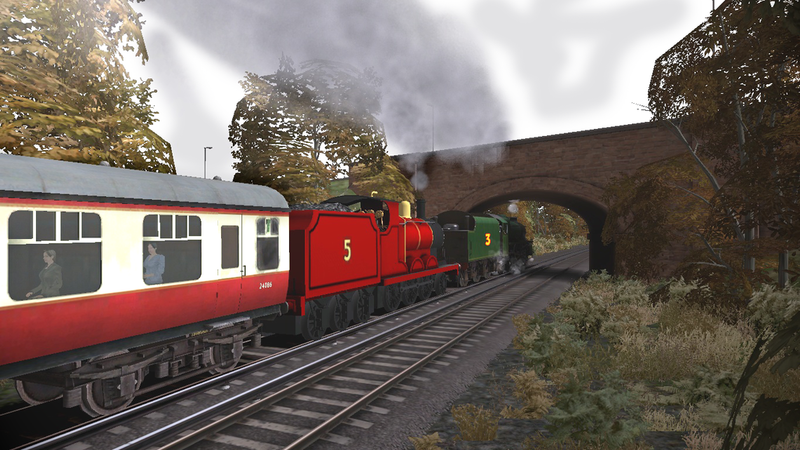 If Bachmann made RTR versions of the Skarloey Railway coaches, using the Talyllyn Railway coaches as a proper basis, I think they'd be swimming in money. Now the question is, will they use the right ones? Talyllyn Coach No. 4 is the right basis for the TV version blue coaches, and Talyllyn No. 3 is thr right basis for the TV version red coaches. I like the look of the Slate Wagons that Bachmann are releasing, but I am suprised really that the Slate Wagons with the numbers (77302 and 77303) have the numbers that have been given to them in the product title. I am also suprised that the numbers in those two Slate Wagons are the numbers in real life, as shown in the image Chaz has posted. I thought they would not have numbers printed on them. I was also hoping that the slate would be different, but they are not. All I hope, is that loads will beremoverable, so consumers can change loads in them, if they wish. Overall, I like them a lot and hope that the final wait for the release will not be long. My only disappointment with them, is that they don't look like the Skate Trucks in the TV series (model era). They do look a lot better to PECO's upcoming release of Slate Wagons though, so a thumbs up to Bachmann for these three releases. The Slate Wagons remind remind me of ERTL models for some reason. Honestly, I don't think that the slate wagons are lazy at all. From a business major's perspective and a modeler's perspective, this was a fantastic move on Bachmannn's part! They have one tooled mold for 3 products. That's like killing 3 birds with one stone! Plus, they're modeled after real wagons on the Tayllyn Railway and we get slate loads! After all, these are the wagons that the TV series slate trucks are based off of! a little bit different looking in the TV series, but they share the same basis! Remember the coal car w/ load and the flat car w/ paint drums? Those were the only two times we actually got loads with a wagon from Bachmann! Also, has anybody else noticed the metal wheels? The other rolling stock has lower quality plastic wheels. Let's not forget about the price too! They're about half the price of the other rolling stock! The low price means that they are cheaper to produce! It's only a matter of time until Bachmann can produce these wagons with faces on them so the models will become even more profitable! These are going to be a pretty good seller! Not to mention the modelers who want a R2R slate wagonn for they're 009 scale model railway who will buy a few at a time! So we get more accurate rolling stock that comes with a slate load and metal wheels at the lower price of the other rolling stock! I'll take 20! I'm not sure which rolling stock you are talking about Anthony. All my Bachmann rolling stock had metal wheels. @titanic - he's referring to the original NG rolling stock released alongside Skarloey that used the PECO tooling.